The National Fire Protection Association’s fire prevention program promotes the following eight tips that people of all ages and abilities can use to improve safety in the home, especially during the threat of a house fire. Follow these tips to improve fire safety. Plan and practice your escape from fire. We’ve heard this advice before, but you can’t be prepared to act in an emergency if you don’t have a plan and everybody knows what that plan is. Panic and fear can spread as quickly as a fire, so map out an escape route and a meeting place outdoors, and involve even the youngest family members so that everyone can work as a unit to make a safe escape. If you live in a condo or apartment building, make sure you read the signs posted on your floor advising you of the locations of stairways and other exits, as well as alarm pull stations and fire extinguishers. Plan your escape around your abilities. If you don’t already have permanently installed smoke alarms hard-wired into your electrical system and located outside each bedroom and on each floor, purchase units and place them in those locations. Install them using adhesive or screws, but be careful not to touch your screwdriver to any internal wiring, which can cause an electrostatic discharge and disable them. Also, install carbon monoxide detectors, which can protect family members from lethal poisoning even before a fire starts. Whether saving on utility bills by using the furnace infrequently, or when using these portable units for spot heating, make sure you give them at least 3 feet of clearance. Be sure to turn off and unplug them when you leave or go to bed. Some electrical appliances draw current even when they’re turned off, and a faulty unit can cause a fire that can spread through the wires in the walls at a deadly pace. This means monitoring what you have on the stove and keeping track of what’s baking in the oven. Don’t cook if you’re tired or taking medication that clouds your judgment or makes you drowsy. Being kitchen-wise also means wearing clothing that will not easily catch on the handles of pots and pans, or graze open flames or heating elements. It also means knowing how to put out a grease fire: water will make it spread, but salt or baking soda will extinguish it quickly, as will covering the pot or pan with a lid and turning off the stove. Always use your cooktop’s vent fan while cooking. Also, keep a small, all-purpose fire extinguisher in a handy place, such as under the sink. These 3-pound lifesavers are rated “ABC” for their fire-suppressing contents. Read the instructions on these inexpensive devices when you bring them home from the store so that you can act quickly, if the time comes. Fight the urge to panic and run if your clothes catch fire because this will only accelerate its spread, since fire needs oxygen to sustain and grow. Tamping out the fire by rolling is effective, especially since your clothes may be on fire on your back or lower body where you may not be immediately aware of it. If ground space is limited, cover yourself with a blanket to tamp out any flames, and douse yourself with water as soon as you can. 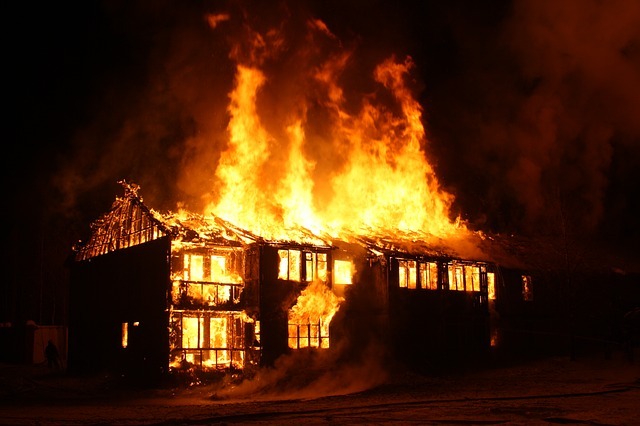 Additionally, always stay close to the floor during a fire; heat and smoke rise, and breathable air will normally be found at the floor-level, giving you a greater chance of escape before being overcome by smoke and toxic fumes. Know your local emergency number. Following these tips can improve safety in your home.